Just Jeeps Alpine PSS21WRA Full Sound System Upgrade For 2015-18 Jeep Wrangler JK Unlimited 4 Door Models | Jeep Parts Store in Toronto, Canada. Jeep Wrangler owners Rejoice! Now you can enjoy huge sound performance even with the top off! 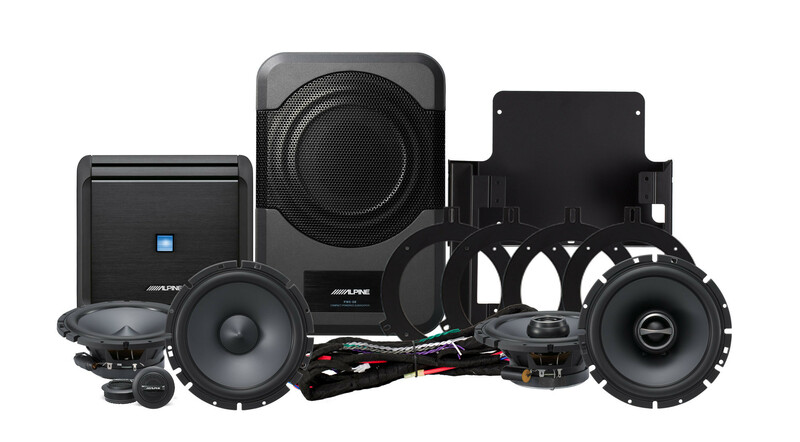 The all new Alpine PSS-21WRA sound system is a 10 component custom engineered kit for the ’15 and newer Jeep Wrangler 4-Door JK to solve the audio performance problems associated with open air driving. By loading the lower frequency sound into the passenger’s foot well area, Alpine’s system delivers amazing sound quality with maximized bass extension whether the top is on or off. The 120-watt system consists of a PWE-S8 powered subwoofer with custom mounting brackets that neatly mount the sub under the driver seat. Kits also include a pair of SPT-70 6.5” 2-way speakers with separate 1” silk dome tweeters for the dash, pair of SPT-71 6.5” 2-way speakers with separate 1” premium silk dome tweeters for the overhead sound bar, an MRV-F300 V-Power 4-channel amplifier with mounting brackets and all necessary wiring harnesses. Kit comes complete and is an easy Plug-N-Play installation that can be tackled in a few short hours. The PSS-21WRA works with any Alpine Restyle dash system, other aftermarket head units or the original equipment factory radio. Huge Performance in Any Situation: The Alpine Full sound system will deliver powerful performance with the Top on or off, giving amazing sound quality especially in open air driving conditions! This 10 component system provides everything you will need to upgrade your factory system to a powerful sound experience. Speakers for the dash, speakers for the sound bar, a 4-channel amplifier, and subwoofer round out this amazing system that is a plug and play installation with no modifications necessary at all. This system will fit with existing OEM systems, aftermarket head units, or any Alpine Restyle dash system which makes this system the most convenient on the market!